The holiday season is fast approaching and with it the rush to spend, overspend, and then spend a bit more. The hardest part about this time of year is that, unlike other times, spending may be directly tied to our emotions. We feel a need to show our love and appreciation for others by spending and most of the time, overindulging those who we buy for. This emotional attachment can sometimes come from a lack of quality time that we are not spending with loved ones, or from our own personal issues. Wherever the emotions originate, tying emotions to our spending is one of the line items that can obliterate our budgets. However, there are other pitfalls that also need to be avoided if you want to escape the sinking feeling in the pit of your stomach come January when the credit card bills start rolling in, or you take a look at the bank statement and wonder what happened. I know this is already November, but if you started your list early in the year, then you’re off to a great start planning for your holiday budget. Yes, I realize that this sounds absurd, but follow along with my line of thought first before you dismiss the tip. We typically buy for the same people every year, there is not much variation in our list of those we purchase for, therefore getting a rough draft list shouldn’t prove terribly difficult. When you make this list put down names of those you buy for and set a hard and fast number you will be spending on each person. This should even be done for your spouse and children and you actually need to stick to this figure. When you have finished your list, total it all up (you should probably be sitting down) then go back and make any adjustments necessary to be sure that you are staying true to whatever amount you feel comfortable spending for gifts. Along with starting your list in September, start keeping an eye out for deals and making purchases. If you have $30 earmarked for your cousin and you find the perfect gift for him on sale or clearance for $20 you can simply mark him off as completed and then take the extra $10 to apply elsewhere or subtract from the larger number budget line and then have a latte for the money you saved! Some suggestions here are during September you can get amazing deals and clearance prices on things like grill sets, outdoor cooking items (BBQ lovers anyone? ), Gardening items, pool supplies, etc. Think about pulling together a gift basket for the loved one who loves to grill out, garden, or who is the proud owner of a pool. The off-season items will not seem out of place at all when they are pulled together with like items in a gift basket made especially with someone’s preferences and hobbies in mind. You have your list all made up, you have amounts next to each and every friend and family member. You likely have been shopping a bit as you go meaning that some, if not most of your gifts have been purchased already. But wait, here comes the biggest shopping day of the year, and oh do those prices and gifts look enticing. Pull out your list, remind yourself of all that you have purchased, likely at very low prices, and don’t go overboard on these hyped up days. Watch out for the pitfall of getting pulled into the hype of “shop till you drop” and “slashed prices” only to bust your budget because, after all, its Black Friday. Yep, it’s another pitfall, don’t fall for it. There are so many deals available not only on Cyber Monday but also throughout the holiday season that you should almost ALWAYS be able to find a free shipping code. Some of the sites to check out before ever making an online purchase include Retailmenot.com and Ebates both of which offer coupon codes and free shipping codes for most major online retailers. Another thing to think about is that if you find an online price at a store you love, wait and don’t buy the item yet. First, do a google search for the item and click the “shopping” link to see if any other retailer is offering the item at a lower discount or with free shipping. This is a seriously underrated way to avoid busting your budget. During the holidays many retailers will price match, some even matching online prices. If you have a smartphone your savings are seriously made a cinch when you can ask the cashier at your local Walmart match a Target price for an item, thus saving you a trip and more temptation to overspend. This is also a helpful option if a store happens to have sold out of an item you went in for, but the same item is available at a price matching store. If you are looking for ways to stay on track with your Christmas budget, you likely already understand the concept of budgeting your family’s expenses and you probably have a food budget. You need to consider what extra wiggle room you will be allowing for during the holidays. Due to out of town guests, parties we attend where we need to bring a dish, cookie making, and finger foods we may serve during gift exchanges the food and beverage budget may soar during the holidays. Think about this well in advance. If you are planning for the increase it will not seem so monumental as you are making multiple extra trips to the store during the month of December. If you are having a get together in your home or are meeting others out for meals more often during the holidays, consider avoiding alcohol and fancy beverages. Alcohol alone can add an additional 30-40% increase in your restaurant bill, an increase that may even increase more as you feel more generous after a few glasses of wine and decide that picking up the entire tab is a great idea, only to be choked up by the total in the morning. Also, if you avoid serving alcoholic beverages in your home while entertaining you will save a substantial amount that can then be turned back into your food bill or even stashed aside for that one or two more gifts you really wanted to pick up for the kids. Offer a unique punch or some well-planned mocktails so that even the children can enjoy. The holidays don’t have to leave us “spent” and anxiety laden as we anticipate January’s bills. 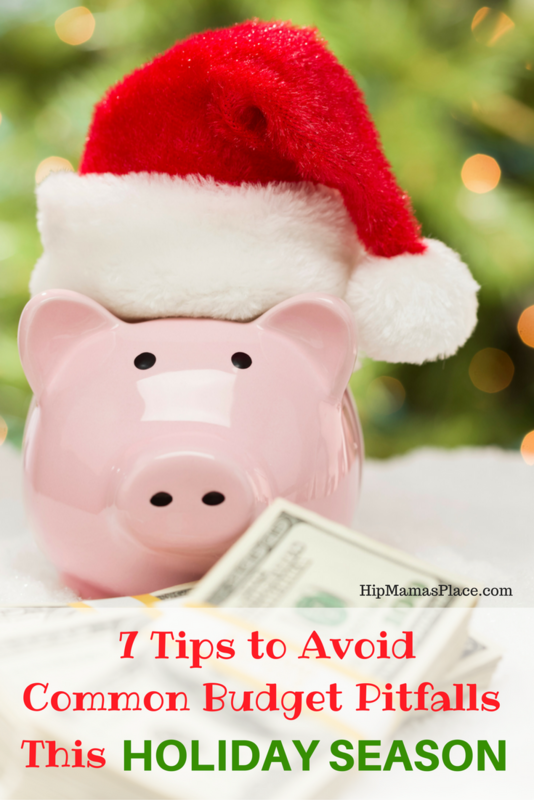 Instead, when well planned and purposefully thought out, we can have a budget and avoid at least 7 pitfalls that will cause us to dread the holiday season. « Amazon Prime Photos “Family Vault” + A Chance to Win a $500 Gift Card! These are really great tips. I feel like i am in such a hurry these days, I am completely not saving on anything! YOur suggestion about Ebates and also free shipping is so correct and so huge. Hidden money saver right there. These are all great tips I really need to start following. Getting an early start would be so ideal. I needed this reminder. It’s hard to keep a head on our shoulders when trying to please everyone around us. The holidays can surely mess up your budget! Thanks for sharing these tips for avoiding that! These are really great tips! Nobody wants budget pitfalls especially during holidays. This is a great read, worth sharing! These are great tips. we are huge on making a budget and sticking to it! Buying off season is one of my favorite things to do ! I am always picking up things when I see them on sale for later uses. While I keep to a budget with the kids, I seem to blow through money on food, party supplies, and things for myself. These are great tips. We set a limit and so our best to stay with in it. Now that the kids are older it can be hard because the things they want are so expensive. Thanks for the great tips. I am always looking for ways to save money. I try to shop the sales all year to save. I make a list ahead of time and set a budget. It can be hard to stay within my budget but I have been getting better each year. I like to do my shopping all year. It saves me money and I get to avoid the crowds. These are some great tips. I always try to buy gifts a head of time. Whenever I find something great on clearance, I’ll usually get it for a gift for someone. Ah, I wouldn’t mind cutting costs by planning my purchases more effectively. If we can plan and buy off season we could probably save a lot. I’m eight months pregnant so we’re definitely avoiding alcohol this year which will be easy on our wallets. I love all of your other financing tips! Thank you for the great saving tips – I will take as many as I can get. I have been buying throughout the year to try and make it less of a burden financially. I used to start buying my Christmas presents as early as August. I would be ready for Christmas by Halloween. I really miss doing that. I need to get back in that habit. Love these tips. I always say I’m going to start early, I need to start making my list earlier. Great idea buying off season too, had never really thought of that. Thank you for these great tips. Everybody thinks that just because it’s a big holiday it’s ok to go outside of the budget, but we’ve been trying to keep it strict so we don’t overspend this year. I try to start my Christmas shopping as early in the year as I can. It really helps with not getting bogged down with money issues in December. Great tips! The holiday season can make things add $$ up!